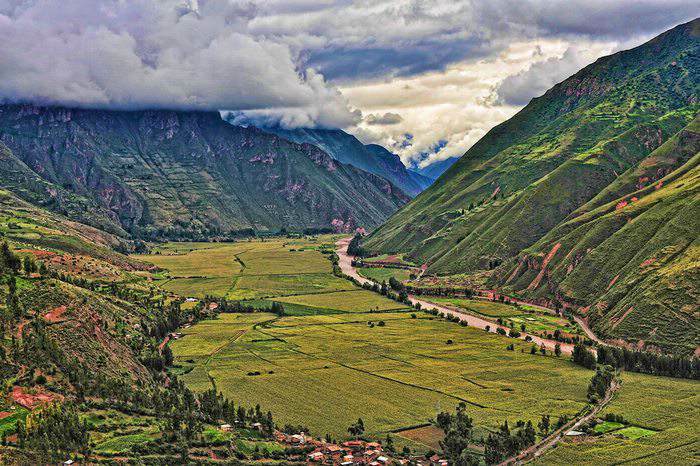 Nestled amongst the breathtaking beauty of the Andean mountains, Peru’s Sacred Valley was an important area for the ancient Incan Empire serving as an agricultural, spiritual and political center. Not surprisingly then, the area is home to some of the most important Inca sites, many of which have been painstakingly preserved for many hundreds of years. A visit to the Sacred Valley is perhaps 2nd only to Machu Picchu for visitors to the area, and our full day tour takes us to the two most important towns. From the comfort of our luxury mini-bus, you can enjoy the spectacular scenery along the valley as we drive first to Pisac and then on to Ollantaytambo. Located in the Southern region of the valley, Pisac is famous for its lively artisan handicrafts market in the main square, and gives us the perfect opportunity to mingle with the local people and maybe buy some authentic local souvenirs. From the square a path winds upwards past agricultural terraces to the Archaeological Park, a hilltop Incan citadel where we find ancient temples, plazas and the Intihuatana; an early stone structure thought to have been a sundial. The views from this point look out across the Quitamayo gorge and the surrounding valley, and so the photo opportunities are spectacular! Returning to our mini-bus, we drive to the town of Ollantaytambo. Now a bustling transport hub for the train journey to Machu Picchu, the cobble-stoned town with its adobe architecture is spectacularly positioned on the Urubamba River amid the snow-capped Andean peaks. Most famous for the hillside ruins of a massive Inca fortress with large stone terraces, the complex is home to the huge Sun Temple and Princess Baths fountain. Our expert guides will delight in sharing with you their knowledge of the history of the area, and the sites that we visit. Many tourists opt to do this tour just before their visit to Machu Picchu and so you can choose to finish your tour in Ollantaytambo from where you can take the train directly to Aguas Calientes (the town at the base of Machu Picchu). We also offer a tour that specifically combines the Sacred Valley and Machu Picchu that is a 2 day/1 night tour, so please contact us if you’d like more information on this itinerary.